So, in this Challenge, we are going to be modifying the Basic Block 1 (on the left) to get the pattern for the top on the right. This time however, since we need to draft the french sleeve and move all the darts, instead of modifying these two pieces, we will trace them on separate piece of paper. So, for the back (see the pic below on left), draw a line from the tip of the dart down to the hem. Place the pattern on a paper and trace from the shoulder dart (from the left dart leg) counterclockwise all the way to where the line from the dart hits the hemline. Then rotate the pattern counterclockwise until the right shoulder dart leg aligns with where you started to trace (where the left dart leg used to be). Then continue tracing from where you stopped (on the pattern) counterclockwise all the way around to where you started. This way you trace the pattern and move the dart at the same time. For more details see the Week 1 challenge. Similarly in the front... Draw a line from the BP straight down to the hemline. Then trace clockwise from the top dart leg, around the pattern to the point where the line from BP hits the hemline. Then rotate the pattern clockwise until the bottom bust dart leg hits where you started tracing, or where the top dart leg used to be before rotating the pattern. Trace from the hem clockwise around to where you started. This was, as in the back, you moved the dart at the same time as you traced the pattern. More details in Week 1 challenge post (the only difference is the position of the bust dart, but everything else is the same). Now the sleeves... 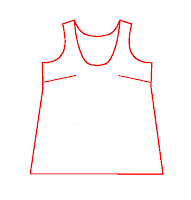 In the front: redraw the shoulder from the neck point to about 1 cm above the shoulder point. Then extend by 8 cm (see pic below). In the back: the arm opening is already wide enough, so just extend the shoulder line by 8 cm. 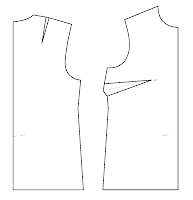 Then, drop the new shoulder point (the end of the shoulder seam) by 0.7 cm on both front and back and redraw and smooth the shoulder line as in pics below. Also, drop the under arm point (the start of the side seam) by 2 cm. I also moved the under arm point out by 0.5 cm, just to make the arm opening curve smoother at that point (where the under arm curve and the side seam meet). Then redraw the sleeve openings. This took a bit of trial and error. The french curve did not work, so I had to do this by hand. One important point, the sleeve curve should be perpendicular to the shoulder seam at the point where they meet. Finally - the neckline. I chose a V-neck, not too deep. I am not going to tighten it this time, because it is not that deep, or wide, and there will be the bow collar. Hope it works. So... measure 5 cm from the neck point on the shoulder seam, and 12 cm down the center line. Connect these two points with straight line. The neck curve should "go" about 1 cm to the left of that line, at about 1/3 of the length of the neckline (see pic below). This makes the V-neck lie flatter. 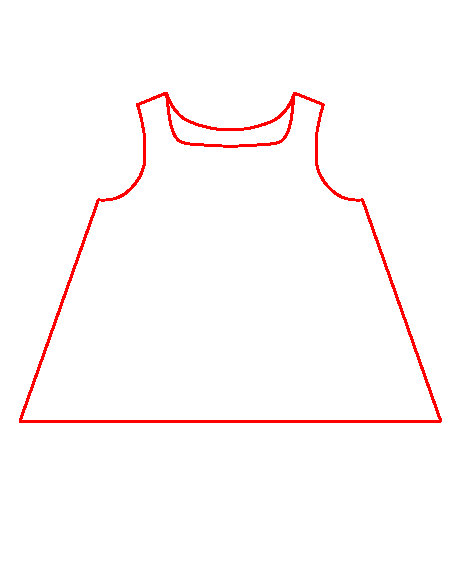 We will also need facing to finish this neckline so I drew it on this pattern too. 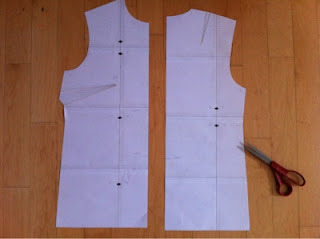 When it comes to cutting the fabric, I will copy the facing on a separate piece of paper. I chose the facing to be 3 cm wide (remember, no seam allowances here). 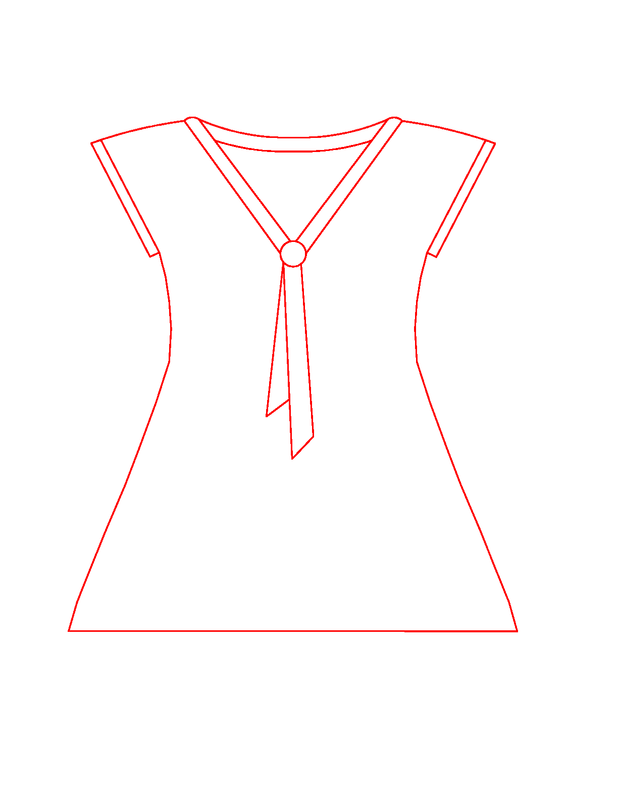 At the bottom of the V-neck, measure 3 cm and then curve the facing slightly to the tip (see pic above). 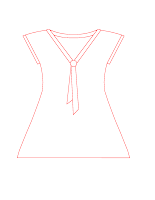 Finally, change the neckline in the back: 5 cm from the neck point on the shoulder, 3 cm down the midline. Also, draw in the facing. 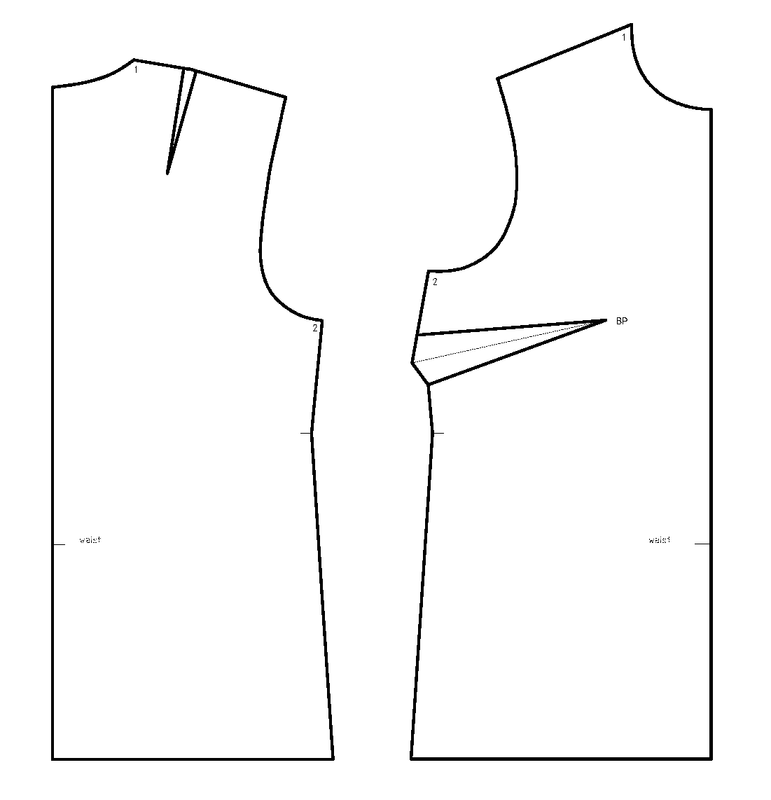 Now you are ready to cut the patterns out and check the continuity of the neck and sleeve curves across the shoulder seam. As you can see, I had to redraw the back neck and facing a bit, but the arm opening were fine (not shown here).